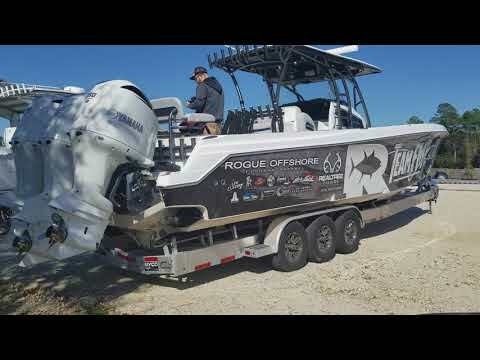 2017 Nor Tech 392 Superfish powered by triple Yamaha 350hp 350 hours!!! Startng with a 3 piece composite construction of glass and Kevlar the 392 is built like no other. The entire single level cockpit is self draining via an under deck plumbing system glassed into the cockpit liner. At the transom there are two 65 gallons live wells plumbed with the finest sea chest pump system ever developed along wlth built in tuna tubes. Power options range from twin, triple or quad outboards with your choice of brand. Combined with our Hi-performance hull you will experience speed,efficiency and range at the top of the class. Add it all together and the competition doesn’t come close.The 392 Superfish…Built your way. Fishermen know exactly what they need while out on the tournament grounds. Some boat manufacturers make an attempt to understand the needs of a tournament angler, but every NorTech boats for sale has experienced anglers on the NorTech manufacturing team so they would be assured that their boat was well-equipped to handle the job. Their time and attention to detail have produced a truly remarkable and well-equipped boat. The NorTech 392 Super Fish is the boat for anyone looking to get into the serious world of tournament fishing. Some boat manufacturers only give their customers one or two choices when it comes to boat options. NorTech understands that choices are important. They offer the chance to customize the boat to your specifications and that includes the motor choices. The NorTech 392 Super Fish comes standard with either twin, triple, or quad power stroke motors, so you can get the speed you really want. The motor choices are further exemplified by the ability to choose from any number of motor manufactures including Yamaha and Mercury. The helm is the most important part of the boat and it should always be user friendly as well as comfortable for the pilot and copilot. Two seats are found at the helm of the NorTech 392 Super Fish and these seats are among the best found on any tournament fishing vessel. Instead of merely being average bench or even single seats, they are instead inspired by the seats found in racecars. As the NorTech 392 Super Fish races toward the fishing grounds you are enveloped in comfort and security from the high-quality seats. The seats are not the only amazing feature at the helm. The dashboard was designed to be the best on the market today with two available and large Garmin navigation screens. The screens are able to be seen easily without the standard glare as they are slightly recessed. The gages are easily accessible as is the ergonomically designed steering column. While at the helm of the NorTech 392 Super Fish you will feel the comfort and quality craftsmanship that goes into every part of the vessel. The NorTech 392 Super Fish is not just an average everyday fishing vessel. It is fully equipped with features that make the vessel easy to fish with which is why it is the top pick for tournament fishermen. 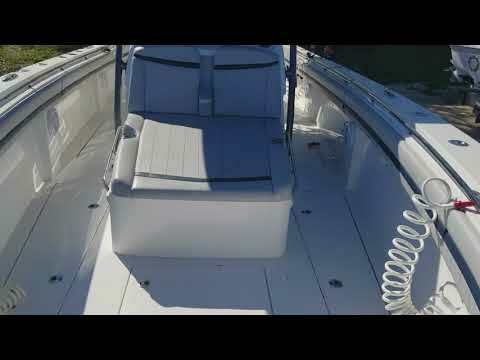 Throughout this center console boat, you will find rod holders to keep your fishing rods stable at all times. There are also bumpers around the edges of the boat to allow for better control while reeling in a large fish. The NorTech 320 Super Fish was designed to be the angler’s best friend. Once the fish are onboard the vessel, the NorTech 392 Super Fish shows off exactly why it is among the most coveted of fishing vessels. The storage on board allows for two 65 gallon live wells as well as 2 tuna tubes. The deck is fully customizable to allow for extra storage and temperature controlled coolers as well. You may have fished with an average fishing boat, but you have not truly enjoyed a fishing experience until tournament fish aboard the NorTech 392 Super Fish. There is no question that the NorTech 392 Super Fish is among the best fishing vessels on the market today. It can take you to any fishing grounds and provide you with ample storage as well as look excellent with custom graphics directly from NorTech. The versatility of this vessel however extends far beyond simply taking anglers to their chosen fishing grounds. The NorTech 392 Super Fish is a well-equipped family boat as well when it is not being used for fishing. The boat can be customized to allow for more seating rather than extra fish storage. Your family and friends will enjoy the boat and you will enjoy the fact that the smaller size if the boat allows for more use in some of the shallower areas of the Florida coast. 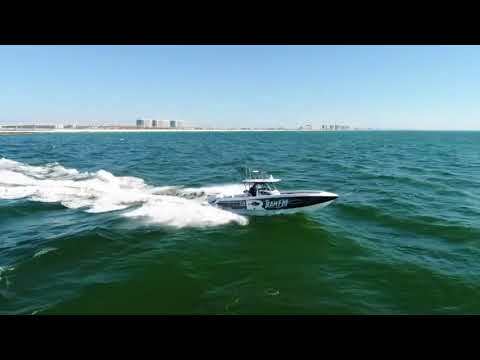 Welcome to USA Coastal Marine USA Coastal Marine is your number one center console brokerage. We do specialize in center consoles but don't limit our brokerage! We sell Jet skis, boats, sport-fish yachts, cruiser yachts, and mega yachts! Our Founder and owner has been working in the Marine industry for 19 years. His experience in Marine sales, social media, and advertising has helped shape the marine industry! USA Coastal Marine will give your vessel the highest amount of exposure to sell faster and produce higher offers. One of the most important features of our site is buyers can view live sea trials on every listing. We know that time is hard to come by and our clients love seeing vessels performing on the water before they schedule an appointment. Our live sea trials set us apart from any other brokerage! Your vessel will be seen on all of our social media sites along with the top major listings sites! We do have a busy road front location where your vessel can be transported to show and sell! Our eBay experience allows us to auction your vessel and provide you with buyers normal brokerages can't! We have a long standing business relationship with a very upstanding shipping company! This allows us to provide cheaper shipping quotes for our buyers. We sell more all over the world! USA Coastal Marine strongly believes in customer service. We treat our clients like family. Our brokerage is family owned and operated. WE CAN SHIP THIS BOAT ANY WHERE IN THE WORLD!!! EMAIL FOR QUOTES! USAcoastal Marine LLC IS A FULL SERVICE BOAT & YACHT BROKERAGE. TO VIEW MORE PICTURES AND VIDEO PLEASE VISIT OUR WEBSITE. WWW.USACOASTALMARINE .WE CAN ALSO PROVIDE A SHIPPING QUOTE IF YOU NEED THE BOAT TRANSPORTED! IF YOU HAVE A TRADE LET US KNOW WHAT IT IS! WE CAN SELL IT FOR YOU OR GIVE YOU A TRADE IN NUMBER ON IT!! WE CAN HANDLE EVERY ASPECT OF BUYING AND SELLING A BOAT FOR YOU. ANY WHERE FROM SHOWINGS,SURVEYS,AUCTIONING,BUY,SELL,TRADE,CONSIGN, INSPECTIONS,SHRINK WRAPPING,SHIPPING,IMPORTING,EXPORTING,RIGGING,CUSTOMIZING ETC...WE HAVE MANY OVERSEAS CLIENTS, AND WE AIM TO PLEASE EVERY ONE! PLEASE GO TO OUR WEBSITE AND CLICK ON THE EBAY LOGO ON TOP TO VIEW OUR ONLINE AUCTIONS! FOLLOW US ON FACEBOOK.COM AS WELL..WE HAVE TWITTER, YOU TUBE, AND INSTAGRAM. SO PLEASE ASK FOR A QUOTE FOR ANYTHING, CALL US ANY TIME Let us help you sell your boat, jet ski, or yacht faster. Our exposure can help you sell faster and generate higher offers. And there is no out of pocket cost. We only get paid a commission once the vessel is sold. Our brokerage is unmatched in the marine industry. We have a busy road front lot with 60,000 vehicles passing by every day. We have 12 boat ramps within a 2 mile radius of our brokerage. Our website is the best out there, all of our vessels are seen in every country in their language. WWW.USACOASTALMARINE.COM We have 122 boats sold on ebay with 100% positive feedback, this makes us a trusted power seller. Our social media produces alot of offers and exposure as well. Our YouTube channel has 250,000 followers, Facebook has 10,000 likes with great reviews, and our Instagram has 75,000 followers. Selling in the marine industry has changed alot, and we have perfected it. Call or txt to discuss how our family brokerage can help you today. Thanks for your time and god bless.